A while back now, I wrote a few posts about the family ‘stuff’ I was finding myself having to go through. Some of this stuff opens windows on quite personal and intimate histories, some of it more public ones. One of my favourite excavations has been the discovery of some more or less random pages from TV and radio guides from 1966. In a cupboard in my mother’s house was a bunch of framed pictures, including one of my two older sisters when they were toddlers. The frame of this picture was broken, and when I took it apart, behind the photograph, the paper used to pack the photo into the frame was old editions of the Radio Times and TV World (a predecessor of TV Times I guess). They are from Spring 1966, shortly after my parents and sisters returned to the UK after their African adventures – the TV World is actually for the old ATV region, and the Radio Times is the Midlands and East Anglia edition. These yellowing pages reveal a lost world of British public culture, when The Fugitive was the exciting new US import on ITV, Sheila Hancock starred in a show as “one of life’s most entertaining victims”, Captain Pugwash was a cartoon strip in The Radio Times, and you could order an Asbestos Garage from £43. 7s. from the back of the same publication. Easter Monday’s schedule on ITV that year was all sport: international swimming, from Llanelly; motor racing, from Goodwood, obviously; racing from Newcastle; and show jumping from Hickstead (with commentary by Raymond Brooks-Ward, who I had never associated with ITV, in so far as I think about his career much at all). The BBC was about to broadcast the first of eight, yes eight, nightly programmes reconstructing the ‘Irish Rebellion’ of 1916. The Letters pages of both publications are testaments to the critical capacities of engaged, active audiences – a brilliant debate about whether or not the plotlines of Softly, Softly were too vague and lacking in satisfactory clarity by the end of each episode, or for that very reason best compared to Kafka’s novels. Or a complaint about the contrast between the national news on BBC radio, presented apparently in “a serious, sensible, and factual manner”, and regional news stories which “are treated in a simpering, pseudo-cosy style”. Pseudo-cosy, what a great concept. 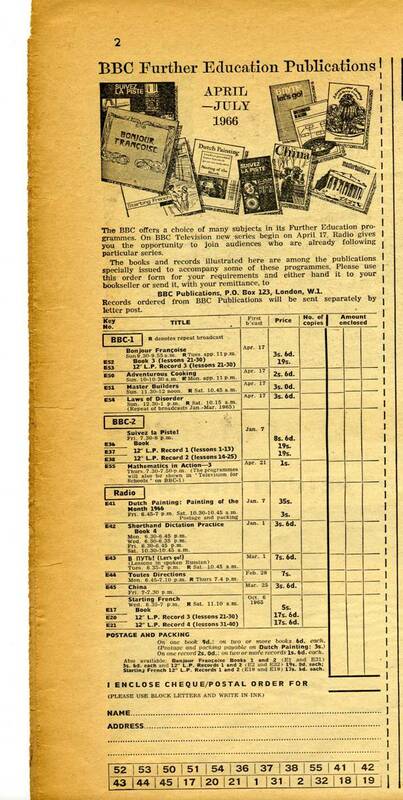 The Radio Times for the 16th-22nd April also contained a half page advert for BBC books and records to accompany its Further Education programmes (Adventurous Cooking, Laws of Disorder) – a peak into the pre-history of The Open University, when the BBC was already pioneering the use of multi-media platforms for adult education. Over at TV World in the same week, the letters were all about how best to make custard pies that flop – part of a discussion with the TV World cookery expert. 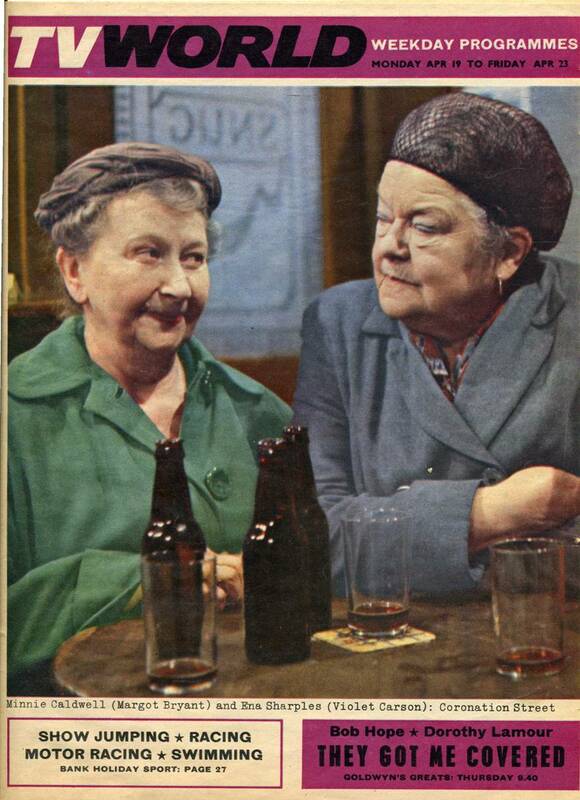 This is from an age before Tiswas. This entry was posted in History, Media and tagged BBC, Coronation Street, ITV, Open University, Radio Times, Softly, Tiswas, TV World by Clive. Bookmark the permalink.